"Since I was a little barefoot girl my heart has been where the green grass grows. My dream was to give others the opportunity to explore the great outdoors and fall in love with a four legged buddy." That's what Maegan Nestman said upon the creation of Maggy's Barn; her farm based learning program just south of Briercrest. "Maggy’s Barn is just a short 30 minute drive south of Moose Jaw located off of highway 339" Maegan said. "You can find Maggy’s Barn on iPhone maps or google map the town of Briercrest in which I am located only 5 minutes south of. There is a little white sign in the ditch upon your arrival." A close friend of Maegan's passed away last spring. The incident was, for Maegan, a reminder of how precious time can be, and how short life is. "In that moment, I made the choice that I was no longer going to be afraid and I was going to follow my childhood dream. Just one year later, with a lot of sweat, tears and the help of my family (& Dave), I am starting to see my vision unfold before my eyes." Maegan with three goats and Rossco, the miniature donkey. A visit to Maggy's Barn consists of a meet and greet with the animals; feeding, brushing and learning basic knowledge. "And most importantly cuddling and playing with the animals" she added. Currently Maggy's Barn is offering family visits and adult visits as well as teen time, in which she plans a more purposeful experience of interacting with animals, as well as learning responsibilities regarding regular animal care. She also offers something called Goat Yoga. She's actually already done a Goat Yoga session. Goat Yoga is exactly as it sounds. It's Yoga, but with Goats. "Why Goat Yoga!? WHY NOT GOAT YOGA!?" she exclaimed. "These playful little creatures could bring a smile to anyone’s face. Goat Yoga is fun way to incorporate what is good for the mind, body and soul." "My goat yoga was unique" she said. It took place outdoors in my grass pasture where my two alpacas and miniature donkey were overseeing the practice." 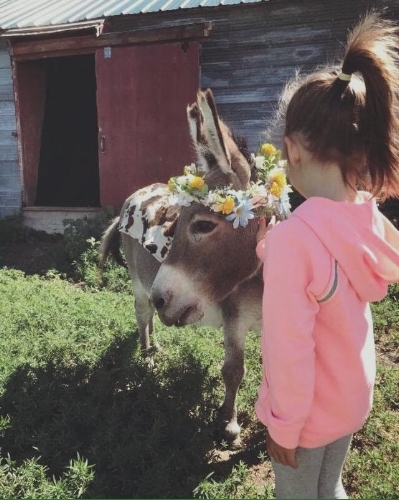 Aside from the goats, the mini donkey and the alpacas, Maggy's Barn also has a quarter horse, rabbits, baby bunnies, hens, ducks, a rowdy dog that acts as a farm hand and several kittens. "I have plans on getting a mini pony, a pig and a peacock" Maegan added. "This year is my soft opening" she admitted. "My purpose this summer was to get my feet on the ground and name in the air, in hopes of each year growing and expanding. I have thus far had an overwhelming response and bookings. I can not wait to see what the future holds for Maggy’s Barn"
About that future, Maegan says she has many plans. Firstly, she wants more animals to love and care for, she wants to organize guided nature walks and hilltop yoga sessions in the Claybank hills. Also, she will eventually be incorporating a teaching program about growing, gardening and harvest. As well as utilizing animal resources like eggs, milk and wool. "I would love to be able to take animals into old folks homes and hospitals" she said. Other plans include providing day programming and day camps; and maybe one day an Airbnb experience. "I still have a lot of learning ahead of me" she admitted. "I have a lot of kinks to work out and a lot of corrals that need fixing but I have the strongest God and the most gracious Angels on my side. I am so grateful..I am so blessed." Maggy's Barn is a seasonal operation; availability is limited for the summer and fall. You can follow Maggy's Barn on Facebook and Instagram. She also has a website. Get in touch with Maegan if you would like to require about booking a time.